TJ DeFender XC (High-Line)3 Tapered Flares (Steel) for Jeep Wrangler TJ 1997-2006. Poison Spyders DeFender XCs provide eXtreme Clearance for Big tires without having to install a tall lift, maintaining a Low Center of Gravity (LCOG) and the performance benefits that come along with it. Like our Standard DeFenders, the XCs are constructed entirely of CNC laser cut, brake-formed 3/16 inch plate steel or aluminum for strength and style that old school tube fenders just cant match. Standard DeFender provide much better tire clearance than Stock or some competitors tube fenders, but DeFender XCs provide eXtreme Clearance!. Like with the Standard DeFenders, the back of the wheel opening is approximately 2.5 inches further back compared to typical tube fenders, and about 4 inches further back than the Stock Jeep flares. But the wheel opening on the XCs is 3 inches higher than Standard DeFenders, providing Massive Tire Clearance with minimal lift! While there are specific considerations to address with any particular Jeep, in Most cases you should be able to run 37 inch tires with no suspension lift, and 40 inchers with just couple inches of lift! See the FAQ section below for a more detailed discussion of tire clearance. Poison Spyder raises the bar for Jeep fender armor DeFenders are the next evolutionary step beyond tube fenders. DeFenders are fabricated entirely from 3/16 inch plate, either heavy duty P and O steel or lightweight 6061-T6 aluminum. CNC laser cutting and precision brake-forming yield a stronger, more functional, better-looking fender than the tired, out-dated tube fender design. Only one competitor manufactures a fender thats anything like the DeFender fabricated entirely of plate with no tubingbut their design leaves a vertical edge of the metal pointed downward, right at the tire. The DeFender has an extra return, or lip along the underside of the fender, which provides better protection from cutting into a Fully stuffed tire, while also lending extra strength to the outer edge of the fender, where it is Most likely to come in contact with rocks, canyon walls, trees, etc. DeFenders are Not tube fenders, they are better! Much of the Jeep armor industry was built upon Poison Spyders original Tube Fender design, which has been borrowed, copied, and in some cases even improved upon, by many of our competitors. But Now the state of the art in Jeep fender armor takes a giant leap forward with the DeFender product line. Rather than tube, the outer edges of the DeFender are brake-formed into a rugged 3-sided rub rail. Most tube fenders use a piece of .120 inch thick (just under 1/8) tubing as the outer edge rub rail, with 1/8 inch thick sheet metal top plates. Compare that to the 3/16 inch (.188) thick material of the DeFender which is carried throughout its structure, from the outer rub rail surface to the top plates to the mounting structure. The DeFender is Not only much stronger than a tube fender, it looks much better as well, with smooth flat surfaces that blend better with your Jeep exterior appearance. DeFender XC Inner Fenders are easy to install and look great. They provide splash protection to the engine compartment as well as a place to mount under-hood accessories. 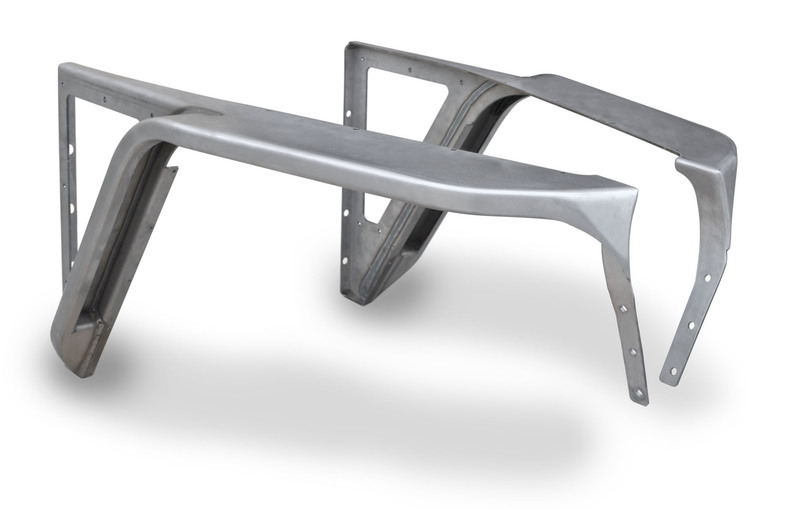 Each inner fender is a 3-piece bolt-together assembly, made of CNC laser cut aluminum sheet. Please Note that no accessory mounting holes or brackets are provided, as each installation is left to the discretion of the installer to decide where to mount components. Most Stock inner fender-mounted components can be re-mounted to the DeFender XC Inner Fenders by simply drilling a hole and/or fabricating a simple bracket. Unfortunately, we have Not yet found an elegant solution for retaining the Stock air box, so an aftermarket air intake or open air filter element (such as a K/N conical filter) is recommended. It may be possible to retain and re-use the Stock inner fenders, for those who wish to do so and save some money. Thats why the Inner Fender kit is sold separately. However we do Not provide instructions for retaining the Stock inner fenders it would be up to the installer to figure out how best to do that. The DeFender XC with 3 Tapered Flare was designed for maximum performance in several aspects. First, it provides the same splash protection of our regular 3 inch flare, keeping mud and debris from splashing up onto the side of the Jeep. But rather than having a straight side, the edge of the flare tapers inward toward the front of the Jeep, in a line parallel to the tapered edge of the hood. In this manner it tapers from 3 inches at the back, to about the same width as our Zero Flare at the front, providing the same great clearance for articulating tires and tight trails that our Zero Flare provides. DeFender XCs are also available in Zero Flare and Negative Flare versions. Access ports in the side of the DeFender make it easy to access the area between the wheel well and the firewall during installation. After installation, these holes are covered with included solid fill plates or with the optional Spyder Side Inserts or Full Length Side Plates discussed below. To add a little extra Spyder flare to your install, opt for the DeFender XC Spyder Side Inserts, which are CNC laser cut from 1/8 inch aluminum plate. The Spyder logo cut-out acts as an air vent to promote airflow through the engine bay. The Side Inserts are designed to bolt to the inside surface of the DeFender, using the supplied stainless steel button head hardware. The Spyder inserts may also be used with the included solid inserts by stacking the solid plate behind the Spyder plate paint the solid plate a contrasting color to make the spyder pop! DeFender XC Spyder Side Inserts are sold separately. DeFenders are available in either heavy duty P and O steel plate or light weight 6061-T6 aluminum plate (both 3/16 inch thick). We recommend steel for those Jeeps whose fenders are frequently in contact with the rocks. For those looking to save weight but are willing to drive with more finesse (Not using the DeFenders as a battering ram), the aluminum DeFenders may be just the ticket. All TJ/LJ versions of the DeFenders come with a custom bracket for lifting the Stock battery tray higher, to provide the extra clearance necessary for the DeFenderslarger wheel opening. This bracket is CNC laser cut brake-formed and fixture-welded for an easy, clean installation. This Is Not A Simple Bolt-On Part! Installing DeFender XCs or any highline fender set is a major undertaking, requiring mechanical skills and tools. Because of this we Do Not recommend this installation for novice mechanics or those who have to have a written, detailed procedure for every contingency that may come up. So you kNow what you are getting in to, here are a few Notes on the installation process. Please be aware that installation of the DeFender XCs Requires cutting the bottom 3 inches off either side of your hood. We plan to offer our own fiberglass XC hood at some point in the future, to be a companion product to work with the DeFender XCs (as of this writing there is no estimated date of availability for it). Cutting the Stock hood is done along the existing horizontal ridge in the side of the hood, so careful cutting will provide good results and a factory appearance. The Stock hood latches may be retained, or the installer may wish to use hood pins instead. If retaining the Stock hood latches, simply drill the mounting holes on the hood higher up. You will also need to drill holes in the DeFender XC to mount the lower part of the hood latch. We left these holes out of the XC version so that installers could opt for different hood latching methods without leaving un-used holes. Likewise, we also left the 3/4 inch LED marker lamp hole out, as many Jeeps running the XCs will Not be subject to DOT regulations, so it is up to the installers discretion to drill the 3/4 inch hole in the front corner to mount an LED marker lamp, if that is desired. Note that it is also up to the installer to figure out how to mount or re-mount any under-hood accessories. Most items will mount by simply drilling a hole and using the OE bracket or mounting screw. Other components may require more ingenuity to mount. Chief among these will be the Stock air box, for which we have Not yet devised an elegant solution for its mounting. Keep in mind that installing these or any brand of highline fenders can be a Big job, entailing major surgery on your Jeep. Because of this, it is assumed that the installer will have above average installation, fabrication and problem solving skills, and can work through any specific issues without the need of detailed, step-by-step instructions for every little aspect of the install. This product ships as bare steel, it will need to be painted or powder coated prior to final installation. We do Not offer a powder coat option for this item.